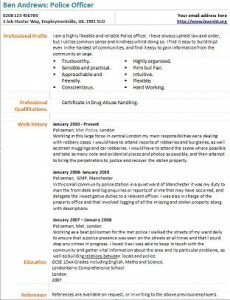 Police Officer CV example and template. You can use following CV example to write your own CV. Amend as suitable and start making an excellent CV for yourself. If you want to be a Police Officer then you can go to Metropolitan Careers site http://www.metpolicecareers.co.uk/) and learn more about it. – If you require to write a cover letter for your application then click here to view job application letter examples. – Click here to visit our job seekers forums and start asking your career related questions or read useful articles. I am a highly likeable and reliable Police officer, I have always upheld law and order, but I utilise common sense and kindness whilst doing so. I find it easy to build trust even in the hardest of communities, and find it easy to gain information from the community at large. Certificate in Drug Abuse handling. Working in this large force in central London my main responsibilities were dealing with robbery cases. I would have to attend reports of robberies and burglaries, as well as street muggings and car robberies. I would have to attend the scene where possible and take as many note and evidential pieces and photos as possible, and then attempt to bring the perpetrators to justice and recover the stolen property. In this small community police station in a quiet ward of Manchester it was my duty to man the front desk and log enquiries or reports of crime that may have occurred, and delegate the investigative duties to a relevant officer. I was also in charge of the property office and that involved logging of all the missing and stolen property along with descriptions. Working as a beat policeman for the met police I walked the streets of my ward daily to ensure that a police presence was seen on the streets at all times and that I could stop any crimes in progress. I loved it as I was able to keep in touch with the community and gather vital information about the area and its particular problems, as well as building relations between locals and police. Get Police Officer CV Template in doc format and start editing for your requirements. These CV templates are the copyright of Learnist.org, 2012. Jobseekers may use these CV examples for their own personal use to help them create their own CVs. You are most welcome to link to https://www.learnist.org/police-officer-cv-example/. However they may not be distributed or made available on other websites without our permission. If you have any question then contact us!